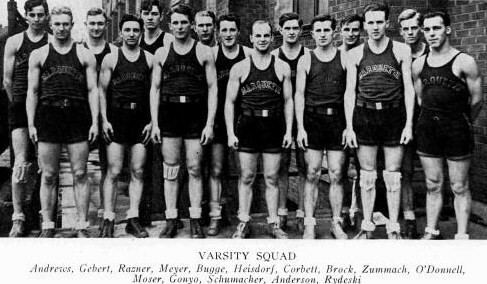 When the final gun sounded in the Notre Dame fieldhouse on the evening of March 3rd, ending the basketball game between Marquette and Notre Dame, the Hilltop cagers ducked for the showers with a sigh of relief. That gun marked the close of a season that was only fairly successful for the Marquette netters, for they wound up their schedule with a record of seven games won and eleven lost. It also marked the close of the collegiate basketball careers of Capt. Floyd Razner, Stevens Point, Wis, forward and John Padden, New Richmond, Wis., guard. The schedule attempted by Coach Murrary and his sharpshooters this year was one of the toughest ever undertaken by a Marquette squad and in view of the fact that the team was composed, for a great part, by Sophomores playing their first year of Varsity competition, the showing made by the Hilltoppers was not a bad one at all. The Hilltoppers opened their schedule on December 8th at the Marquette Gym by handing the Milwaukee State Teachers' College quint a decisive 31-22 trimming. Razner and Bugge featured the game for the Murraymen, the former counting nine points and the latter eight. This start gave the boys all kinds of pep, but Northwestern University took it all out of them on December 13th at Patten Gym, by handing the Blue and Gold Standard bearers a lopsided 53-22 setback. The less said about this game, the better, except that the Marquetters never had a chance after the rangy Purple cagers swung into action. Then came the Christmas holiday campaign. The Loyola Ramblers came up from Chicago on December 21st and handed the Hilltoppers a 20-9 setback in one of the slowest games of the year. After a week's layoff in which much time was spent in ironing out wrinkles that had cropped up, the cagers hopped the rattlers for Minneapolis, where on December 29th, they lost a fast 38-22 game to the Big Ten Gophers. James O'Donnell was shifted from guard to forward in this tilt and celebrated the change with three baskets and an equal number of free tosses to lead his team in scoring. December 31st, New Year's Eve, found the cagers back in the Hilltop Gym, doing battle with Sam Barry's powerful Iowa quint. The Hilltoppers played sensational ball during the first half, holding the Hawkeyes to a 9-7 score, but went to pieces in the last half and lost, 31-17. After this series of disasters, Coach Murray must have dragged the boys into a corner and given them a good talking to, for they went to work and won four out of their next five games. The barnstorming Oregon Aggies were the first to feel the reversal of form, losing a hair-raising game in the Marquette Gym by the margin of a single point, 16-15. 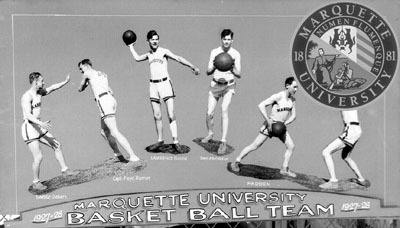 James O'Donnell, sensational Sophomore forward, endeared himself to Marquette cage fans by scoring 13 of his team's 16 points, counting five field goals and three free tosses. Lawrence took a 31-21 trimming at Appleton on January 6th, but on January 10th, Loyola won its second game of the season over the Hilltoppers by a 27-12 score. The game was played in the Windy City. Marquette continued as a jinx for Creighton on the Milwaukee floor and handed the fast-stepping Blue Jays their first defeat of the season by a 26-20 count on January 14th. O'Donnell and Razner featured the Marquette attack with seven baskets between them, while Diesing led the Omaha quint with three ringers from the floor. Michigan State next felt the taste of defeat, dropping a 21-18 decision to the Hilltoppers in the Marquette Gym on the evening of January 21st. On February 4th, Butler invaded Milwaukee and defeated the Hilltoppers in one of the best games of the year, by a 23-20 score. The game fairly bristled with speed from start to finsih and seldom, if ever, was there more than one or two points separating the two teams. Captain Razner flashed sensational form for Marquette, counting four baskets and five free tosses while Holz duplicated this performance for Butler. Following the Butler setback, the Hilltoppers turned in successive victories over Lawrence and Des Moines, winning over the former by a 29-20 cout at the Marquette Gym and the latter in Des Moines on February 17th, by a 39-18 margin. The next night saw the Murraymen in Omaha, where they dropped a 38-21 tilt to the Creighton Bluejays. This was sweet revenge for the Bluejays, as they felt keenly the defeat suffered in Milwaukee a few weeks previous. After the Creighton game, Coach Murrary escorted his battered cagers back to the Hilltop, where on February 23rd, they played their last home game of the year, losing to the powerful Notre Dame quint, by a score of 23-13. February 25th found the Hilltoppers again on the road, this time at East Lansing, Michigan, to do battle with Michigan State. Doped to lose, the Staters pulled a big upset and handed the invading Marquetters a 30-25 setback in a sensational game that held 3,000 spectators breathless from the start to the exciting finish. Captain Razner again featured for Marquette with five baskets and three chairty tosses. From East Lansing, the Blue and Gold cagers hopped down to Indianapolis for a return game with Butler on February 27th. What happened to the Hilltoppers in this game will always be a matter of conjecture, but whatever it was, the fact remains that Butler ran riot in the scoring column and won by a 53-15 count. Notre Dame trimmed the Murraymen in the final game of the season at South Bend, by a score of 24-19. The work of the Marquette squad was featured by the brilliant play of Captain Razner and a couple of sophomores. James O'Donnell, playing his first year as a Varsity man, led the team in scoring with 46 field goals and 21 free throws for a total of 113 points. Captain Razner was next in line with 91 points to his credit, while Roy Andrew, Sophomore center, was next in line with a record of 71. The Hilltoppers scored a total of 388 points as compared to 492 for the opposition. This past cage season is a good example of what an all-star high school caging aggregation will dow when it hits the tougher competition of college basketball. Three years ago, Marquette University High School boasted one of the best high school caging quints in the country. Twice in three years, they went into the finals of the National Catholic High School basketball tourney held at Loyola gym in Chicago.